Strange. I mean, I was a teenager! 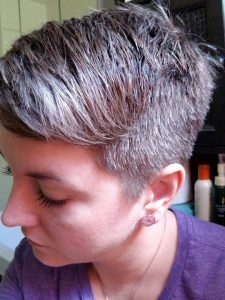 I played with dye long before I ever found my first gray because I thought my natural color was boring (oh, you dumb kid!). When it became more evident, I dyed consistently for about 10 years. 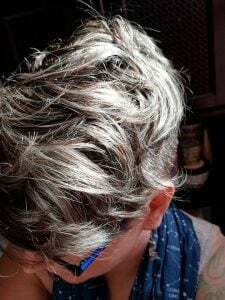 I tried to stop dyeing before but because I was in kind of a funny place in life, it was really hard to look in the mirror and see the gray. It was a pretty strong reflection of how tired and dejected I felt. It also didn’t help that I was in the process of helping my mom have several joint replacements and seeing her in such a vulnerable place was difficult for me. She had stopped dyeing her hair a long time before and I had just never considered her mortality/age before and the gray in my hair looked way too similar to hers. I just couldn’t do it. I wasn’t ready to look her age, especially since I felt so much older than I was at the time. I did both, although eventually I only used the salon. I was tired of wasting the time and energy on trying to maintain a dye job. I couldn’t wash it as often as I wanted to because I was afraid of literally washing hundreds of dollars down the drain. I also stopped when I saw a lot of younger women ditching the dye and going natural. They didn’t look old and tired the way I thought I had when I first tried to stop coloring my hair. I wanted to try again. They effused confidence. 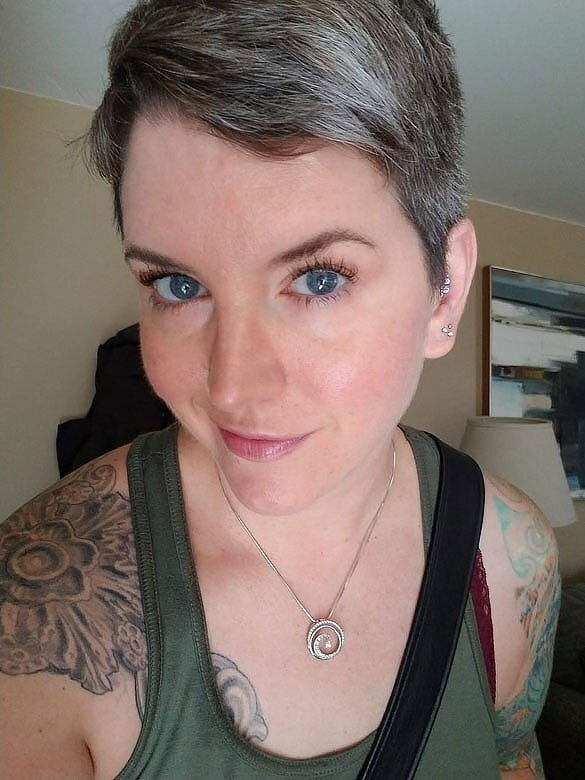 My original plan was to stop dyeing my pixie for a while and then buzz it off. I was planning a long vacation about four months out where I would be wearing a hat of some sort almost exclusively so I thought it’d work just fine. My poor stylist looked like she’d seen a ghost and kindly suggested a less dramatic approach. 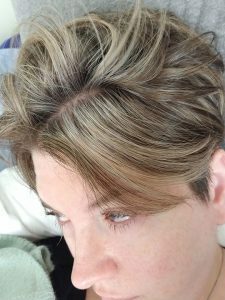 She highlighted my dyed brown hair heavily and stopped dyeing my hair a base color. She would tone the bejeesus out of my hair to help avoid the brass and I think it worked beautifully. I never had a dramatic line of demarcation and when the color was all gone, it wasn’t such a shock. How far along are you in the transition process? And how are you feeling about it? Are you happy with your progress? I am done! Of course, my hair is only about an inch long, too! I feel good! 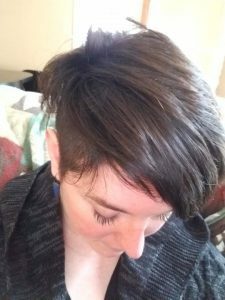 I’m ready for a little more length and to go back to the undercut pixie thing I’d been wearing but other than that, I feel so much better about this transition than the one a couple years ago. I decided in February I was done, had highlights in March, and finally cut the rest off in June. So, it took about 4 months. The freedom is great – I feel good, for sure! It felt awesome to pack nothing for my hair for that vacation that I was originally planning to buzz my hair for. Whatever shampoo was at our AirBnB was what I used. I didn’t worry about keeping a hat on to protect it from the sun, or freak out about chlorine or weird water. I didn’t realize how much energy I was using til I wasn’t. I don’t want to be tied to something like hair color. I wanted the ability to be ok with what I saw in the mirror without feeling like I “had” to do something to my appearance, be it dyeing my hair or wearing makeup. 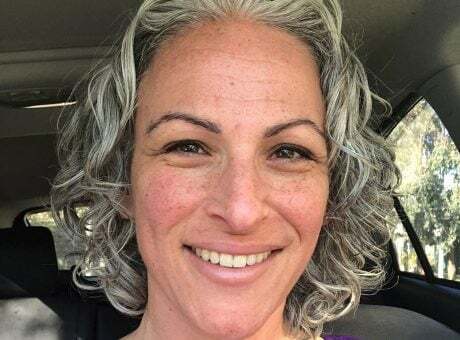 Women I saw who stopped coloring their hair seemed so confident; I wanted some of that! Did you face any push-back from friends and/or family? Nope. Everybody was supportive, even my kiddo who said he was jealous of my silver hair! 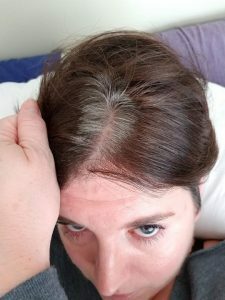 The only person who had ever been negative about not coloring hair was my dad, which was ironic since he’d had a full head of silver hair for as long as I’d known him. Would you take this route again? 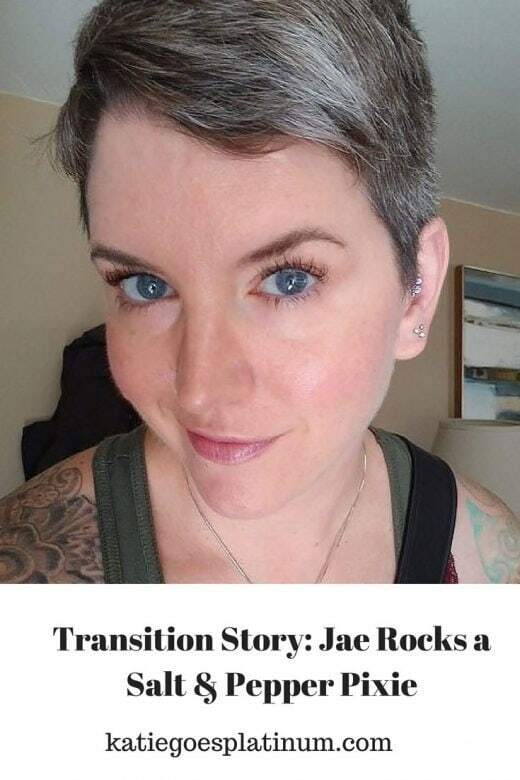 I think the route I took to transition worked for me. Obviously lopping off all of one’s hair isn’t for everybody, either for comfort or personal style. 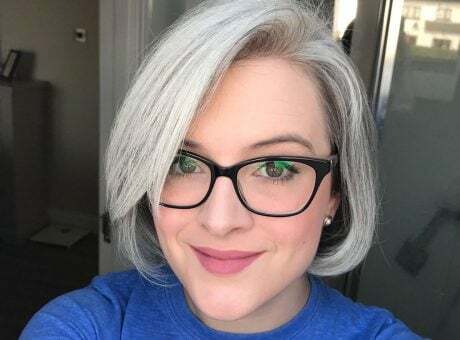 Aside from maybe coloring it a fun color with my kiddo, I don’t see myself ever dyeing my hair to color gray again. I enjoy the freedom I’ve given myself too much. Purple shampoo/conditioner/treatments, especially if you’ve gone the highlight-to-blend route. It helped keep things from looking dingy. 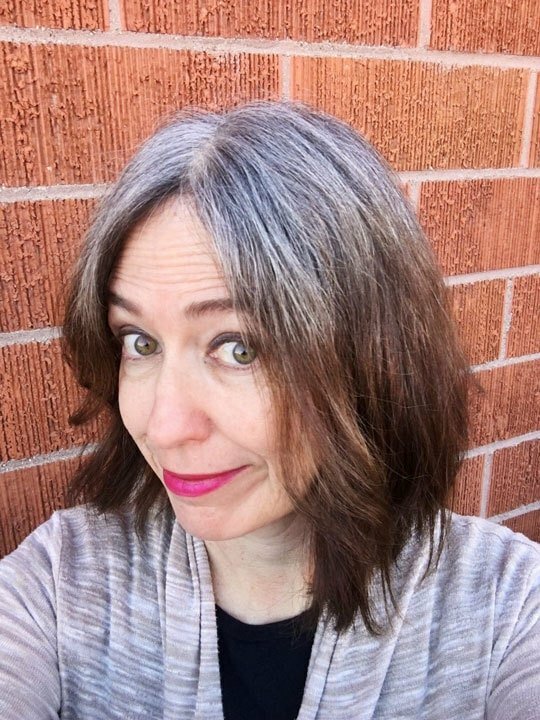 I do recommend getting some highlights to help ease the shock of growing in a markedly different color. A brighter blush or lip color makes a huge difference, especially once the gray has grown in. It also helped me when I felt particularly frumpy during the process. Stylists who don’t want to work with you and aren’t supportive of your choice. 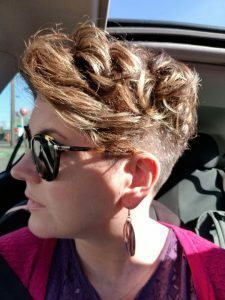 I was grateful my stylist encouraged and helped me along the way. It would have been so easy for her to give me grief about it but she didn’t. That helped me a lot. Purple shampoo! Let those silvers shine! Did you have any online role models? 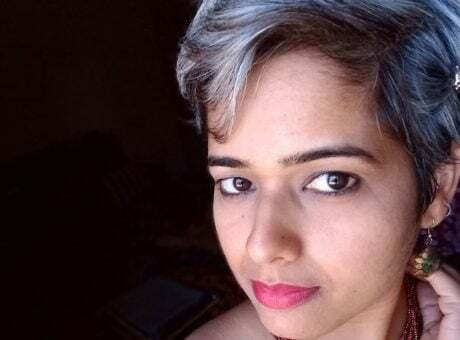 The first time I stopped coloring my hair, it simply wasn’t the right time for me. I was exhausted and pretty unhappy with my life situation and the last thing I needed was a reminder that I wasn’t getting any younger. After about six months, I began coloring it again. On the one hand, it felt so much better to not see the gray. On the other, I felt bad that I’d let my vanity get the best of me. I decided not to beat myself up since that’s what I needed at the time and I knew I could always try again. So, I guess I’d like to say to the ladies thinking about doing it: try it! And if it isn’t for you right then, color away! As it is often said, it’s just hair. And if you grow it all out and don’t like what you see, color it all again and love what you see in the mirror. I guess all this is to say I’m in favor of what makes YOU feel good, whatever that happens to be.